Black Dragon® gloves are easy to slip on and the fully textured surface gives a better and more secure grip on tools and equipment. The black color provides better framing effect and color definition and eliminates distractions from stains and coloring on the glove, which provides better eye focus. 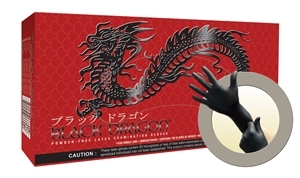 Black Dragon® gloves are manufactured under an ISO 13485 quality system and are lab and field tested to meet or exceed stringent ASTM criterion to withstand pinhole defects for unsurpassed protection and peace of mind. Recommend for use in the following industries: Automotive / Industrial Safety / Laboratory / Tattoo & Piercing / EMS / Law & Corrections.